I finally arrived in Cape Cod. I have been looking forward to a vacation and some time off from work. We got upgraded at the rental car counter because they were overbooked. Ended up with an Explorer for the price of a compact. Good thing because I needed the space to store my nail supplies. I only brought 100 of the polishes I really thought I couldn't live without for the week. And a small box of various other art supplies. The weather looks like it will be rainy here quite a bit so I am glad I brought it because it will keep me entertained for the week. Before I show you my design for today, I wanted to encourage you to jump back to my post from yesterday. I am two more followers closer to 200. I want everyone to start thinking about the questions that I will be asking for when you enter. So, my design for today is Color Club Wing Fling with dots that have been placed heavier near the tip. The first pic is indoors and the second shows the shimmer better in the sun. Fun! Hopefully the weather isnt horrible! This looks fantastic!!! So cute and fun!! :D The weather here has been pretty rainy, but I don't mind!! It's better than the 36 degrees Celsius we had a week ago! 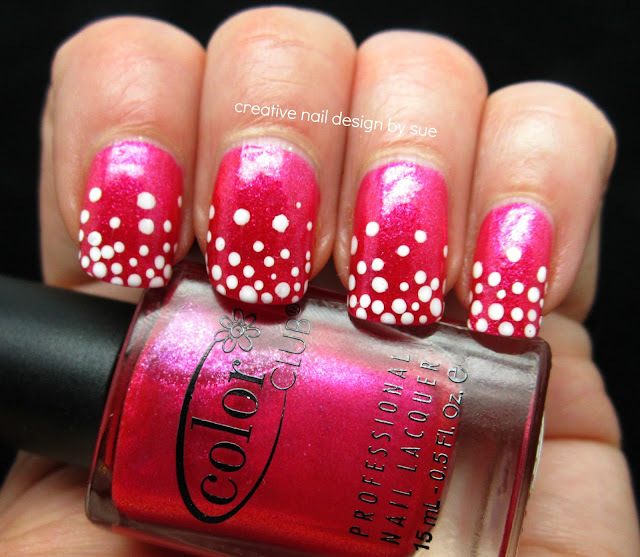 I love the color and the dots! Pretty! I love that the dots are random!